Are you protecting your cuticle layer from uneccessary protein loss? Combing is just one of those things we all have to do on a regular basis for grooming purposes and managing tangles. This is why I have to share with you some interesting facts I read about as a result of a study conducted in 1995. In the study presented at the Annual meeting of Cosmetic Scientists. Researchers sought to isolate and measure the amount of protein the hair strand loses during the simple acts of shampooing and combing. Their hypothesis was that hair fragments from the cuticle layer are chipped away gradually causing eventual deterioration of the hair strand. As part of the study, the researchers combed strands of hair for 10 strokes, measured protein loss, then combed again for another 10 strokes, measure, and continue with the same process for up to 100 strokes. As you would imagine, they found that the amount of protein loss increased directly in correlation with the number of combing strokes each strand received. The next phase of the study involved shampooing the strands of hair. Following the shampoo, the strands were combed to see how much protein would be lost as a result the process. In this particular study, they tested the effectiveness of two separate shampoos. "Brand B" was found to offer better protection against cuticle chipping protein loss than "Brand A". Not only that, they also noticed that the strand shampooed with Brand B did not increase the protein loss amount as they continued to increase the number of combing strokes. So in other words, "B's" protection of the strand remained consistent no matter how many times the hair was combed during that session. I tried desperately to determine what ingredient(s) were unique to Brand B that set it apart from "A". No clue was given in the study other than the fact that "shampoo B [allowed the hair to] comb significantly more easily than shampoo A." Overall, the researchers found that protein loss was the highest in non-conditioning shampoos. Although most of the study was conducted on virgin hair, those involved in the research took it to the next level by testing chemically altered hair (permed/bleached). Obviously, hair that was chemically treated saw the highest amount of protein loss during manipulation. This is due to the changes to the hair shaft after the chemicial treatment. The cuticle layers are more prone to open up as a result of the process. This makes it easier to experience chipping during manipulation. One of the conclusions made after testing both virgin and processed hair is that the same conditioners which helped to provide some cuticle protection to virgin hair, offered little to no protection when used on the same type of hair after a chemical process. Remember when I posted a link to Royale3086's regimen video? If you recall, Royale said she opts for products made for damaged/dry hair even if her hair looks and feels strong. I have always followed the same reasoning. Don't go by how healthy your hair seems. If you have udergone any chemical process, always reach for extra moisturizing/strengthening products made specifically for chemically treated hair. Your tresses will respond much better to these types of products, and they'll to protect your even after the product has been washed out. I should also mention that the method researchers used to collect the lost "protein" for measurement was simply by shaking the hair strand in a container of water. The loosened hair fragments would be extracted from the water for assessment. When I read this, I thought about how much protein we could be loosing just from the simple of act regular washing. This study was quite interesting, for me, so I thought I'd list some key tips that we can learn from to protect our hair from this dreaded protein loss. Protein loss in the hair strand increased with the number of comb/brush strokes. Knowing this, we should always make sure that when ever we comb, we lubricate the hair with our most effect moisturizer and or natural oil. This will help to create that "ease of combing" which reduces protein loss. Ease of combing=fewer strokes. If you are not pre-pooing, shame on you! By pre-pooing, you are providing extra cuticle layer protection prior to the manipulation that will occur during your wash. Even if you aren't scrubbing the hair clean, there will be some friction during the process. Protect your hair, do...not....skip.....the.....pre.....poo.....step. Add some coconut oil to the pre-poo. Coconut oil, in a different study, was found to help penetrate the follicle bringing it's nourishing properties all the way down to where the hair needs it most. Always go for products designed for weak damaged hair. Even if your hair feels strong at the moment. Remember, the chipping away is gradual. If you aren't always providing your hair that protection, you might find yourself reacting to damage later on instead of protecting your hair from further damage today. 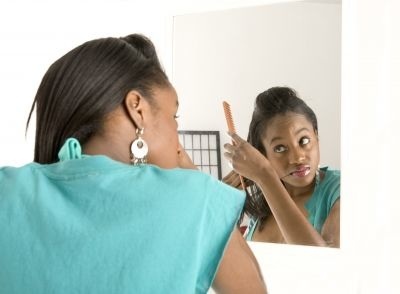 Use detangling combs to help with ease of combing. Remember, the fewer strokes you use, the better. Of course, remember, to use the most extreme care you can whenever handling wet hair. Do not stop searching until you find the perfect conditioning shampoo. The more slip/softness the shampoo provides, the more protected your cuticle layer from excessive chipping. Stock up on ceramide containing products. Remember, ceramides are the quintessential glue that helps keep the cuticle layer intact. The more ceramide your strand contains, the better chance it has at withstanding damage due to manipulation. I don't know about you, but I can certainly say that I benefited from learning from the findings that resulted from the study. Going forward, I'll be thinking about the tiny little cuticle chips that I may stand to lose anytime I get lazy, or heavy handed with my hair (especially during the wash). Hope this helped you. I know it will make a big difference in how I approach my wash going forward. Thanks for posting this. So many points to consider. Yes, I am one of those that has been a little rough with combing my hair. One of the points that stood out to me was about using products for damaged hair even if your hair seems healthy. The extra moisturizing properties cannot hurt. Also prepooing definitely helps, too. Your posts are so helpful...thanks! I REALLY love your blog, thanks for all the great info. Is your water robbing your hair of moisture? Summer's coming. Is your hair protected?